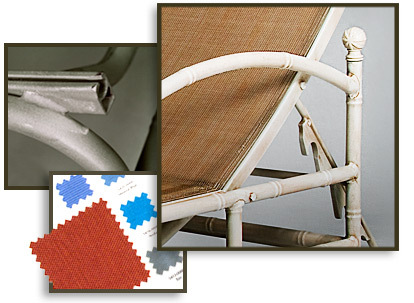 Aluminum Powder Coating offers complete sandblasting, welding and refinishing of outdoor patio/pool/balcony furniture. Vinyl restrapping, sling replacement available in assorted colors and patterns, custom tailored fit cushion replacements available in all of Sunbrellas’ outdoor fabrics. APC also refinishes gates, railings, metal shutters, outdoor benches, lighting fixtures and just about anything in metal.